Emerging from the blues and R & B scene of South Wales in the 1967, a band called the Cellar Set reinvented themselves as Blonde on Blonde, taking their name from Bob Dylan’s iconic 1965 album, and set their sights on the burgeoning psychedelic and progressive rock market. Comprising guitarist Gareth Johnson, singer/guitarist Ralph Denyer, Richard Hopkins on Bass guitar and keyboards, and Les Hicks on drum, they headed for London in 1968, and with gigs at the new “underground” venues like Middle Earth started to make a noise around the business. Signed to Pye and with an album produced by Barry Murray of Mungo Jerry fame, they appeared at the 1969 Isle of Wight Festival, headlined ironically by Bob Dylan. They went on to record the two albums featured on this 2-CD set for Ember Records, but like many of their contemporaries they never went on to achieve the success their talent and excellent recordings deserved, and they have become one of the collectors’ curios of the era. 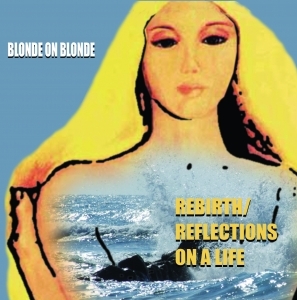 ‘Rebirth’ and ‘Reflections’ are the band’s final two recordings and they capture a hugely intriguing fragment of rock history – a significant chunk of the career of a band that was probably as good as most things that were happening at the time but who were never destined to make the big breakthrough they deserved.